Sri Hargobindpur is a town and a municipal council in Gurdaspur district of Punjab. A new village called Gobindpur was established near the village of Ruhela, on the bank of the Beas river by Sri Guru Arjan Sahib Ji in 1587. Guru Arjan named this new village in honour of his young son Hargobind. However, after the arrest, torture and martyrdom of Guru Arjan, the area fell under the control of Diwan Chandu Lal (an influential hindu banker and chief minister of emperor Jahangir. Jahangir took control of the whole area, but it was neglected and soon fell into ruin. During the rainy season, Guru Hargobind Ji left Kartarpur and camped at the village, Gobindpur. Guru Hargobind decided to rebuild and enlarge the town on the open space at the bank of the river Beas. The village still had the ruins and bricks from the village begun by his father. Pleased at the attractive view the site commanded, Guru Hargobind named the village Sri Gobindpur. But because of his own association with it, the place came to be known as Sri Hargobindpur, a name still commonly used. 1629 Battle Of Hargobindpur - Guru Hargobind and the creation of a town over Ruhela, revenge by muslims over death of Bhagwan Das. There are 4 Historic Sikh Gurdwaras and 2 other historic places of interest in Sri Hargobindpur. Baba Budha Ji and Bhai Gurdas Ji also came here to meet with Sri Guru Hargobind Sahib Ji. After Guru Ji left Sri Hargobindpur, the gurmat literature continued to be written at the Gurdwara. Gurdwara Granthi's were given training and made ready to help sangats all over Punjab. Maharaja Ranjit Singh donated the jageer for this gurdwara which was from Jalalpur Jattan. 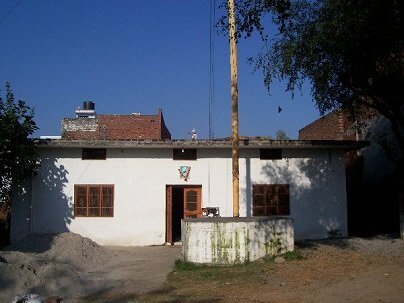 Gurdwara Sri Baba Jaani Shah is a small square building which once contained the Mazhar (tomb) of Baba Jaani Shah. Now within this building the parkash of the Sri Guru Granth Sahib is done. Baba Jaani Shah, before he became a devotee of Guru Hargobind Sahib Ji, had long been searching for God, but was unsuccessful even though he had looked far and wide. Then, guided by Khwaja Roshan, the (Guru's servant), Jaani Shah met Guru Hargobind, gaining joy, internal satisfaction, much relief and eventual salvation. Baba Jaani Shah was one of decendants of Hazrat Muhammad. One day, Sayyed Jaani Shah, a muslim devotee had a great urge and intense longing to find and connect with God. He left his family in the hope of finding a path to God. He disguised himself as a faqir (religious man) and set off on his trip to find eternal peace. However, many days later, he was still wandering at dusk, as the sun disappeared in the west. He tried everything; praying to the gods of the hindus and muslims; he did the five namaz (muslim prayers) daily, but despite all his efforts and his constant searching he found nothing. Jaani Shah was told about Guru Nanak's house. What he heard about the Guru filled his heart with happiness. So he traveled to meet with Khawaja Roshan (the sewadar of the Guru's horses). After he told Khawaja of his relentless search for God, Khawaja told him to pray before the Guru sitting at his dwaar (home). Following the instructions given by Khawaja, Jaani Shah sat at the Guru's dwaar (house) started praying. The Guru sent a Sikh to Jaani and asked him what he wanted; money, clothes, etc, - you will get it. But Jaani declined and said "Jaani ko Jaani Mila dao". (Please enable Jaani to meet Jaani (beloved Lord)). Guru Hargobind arose and devised a test for Jaani. He said to his Sikhs, "If Jaani wants to meet the beloved God, tell him go and jump in the Beas River". After hearing that from a Sikh of the Guru, Jaani immediately started to run towards the Beas. The Guru promptly sent Bhai Bidhi Chand Chinna after Jaani to quickly bring him back. On his return, Guru Hargobind Sahib hugged him. Thus it was that Jaani Shah was introduced to the true Lord by Guru Hargobind Sahib. The Guru blessed him saying, "If anyone comes to Jaani Shah's place, all their desires shall be fulfilled." After winning the Battle of Hargobindpur, Sri Guru Hargobind Sahib Ji untied his Kamarkassa (waist band) at the location of Gurdwara Sri Damdama Sahib and rested here (hence the name Damdama). Guru Hargobind buried the dead bodies of Abdullah Khan, his two sons and 5 chiefs here. Afterwards, Guru Hargobind raised a thara to sit on and held a diwan for the Sikh Sangat. Later, Jassa Singh Ramgarhia constructed a Gurdwara Sahib. Gurdwara Sri Manji Sahib Sri Hargobindpur is also known as the Gurdwara Guru Ki Haveli and Gurdwara Guru Ka Mehal as this was where Sri Guru Arjan Sahib Ji, Mata Ganga and Sri Guru Hargobind Sahib Ji lived. Located in the center of town, the Guru's home had a well and was a three storeyed building. The building fell into ruin however the old well is present. A new Gurdwara is in the process of being established by Nihang SInghs so that Sikh history can be preserved. Guru Ki Maseet, or the Guru`s mosque, is in the eastern part of the town. Sikhs values rise far above other world religions and in establishing Sikhism as an inclusive universal religion Sri Guru Hargobind Sahib Ji built a mosque for muslims. Residents of all faiths flocked to the Guru Hargobind and perceived themselves as heirs to the sixth Guru's desire to found a secure and secular home on the banks of the Beas. 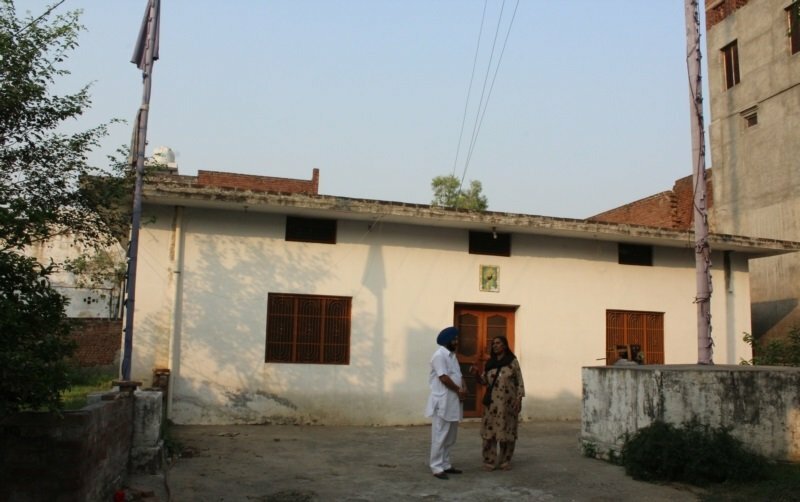 The Sikhs built a Gurdwara but the local muslims did not have the capacity to build themselves a place of worship due to their smaller numbers. They came to the Guru and asked him for help. The wise Guru was as respectful of muslim faqirs as he was with hindu sadhus and his Sikh followers; he viewed people of the differing religions of India with one benevolent gaze. The Guru ordered his Sikhs to start construction of a 'Maseet'. The maseet was duly completed and duly handed over to the muslims. Guru Ki Maseet is recognized as a historic site by UNESCO. The maseet has existed in this location since the period of the sixth Guru. With the turmoil of the partitioning of India in 1947 and the mass movement of people, the maseet fell into a state of neglect and disrepair. In time, the care of the maseet fell into the hands of a group a Nihang Singhs who temporarily kept the Sri Guru Granth Sahib in the one time maseet. For many years, the maseet was maintained by these Nihangs. In February 8th, 2003 a 'Memorandum of Understanding' (MoU) was signed by Baba Kirtan Singh the chief of the Nihangs, the Sikh caretakers of the maseet, and the Punjab Waqf Board. It was Baba Kirtan Singh's desire that muslims again perform their prayers at the maseet which had been gifted to them by Guru Hargobind. Likewise, when the hindu followers asked Sri Guru Hargobind Sahib Ji to establish a place of worship Guru Sahib helped them. This makes the subsquent beaviour of the hindu government of India and its treatment of Sikhs and Sikh genocide all the more appauling. Some hindus still refuse to recognise Sikh genocide, they turn a blind eye to the crimes of their ancestors and are happy to live in ignorance and denial. When you constrast the behaviour of mughal muslims and hindu rajputs against Sikhs, in particular the martyrdom of Sri Guru Arjan Sahib Ji, then you realise how special Sri Guru Hargobind Sahib Ji was and what it means to be a Sikh. There is stark difference in the behaviour of muslims and hindus who often deliberately destroy each others historic heritage.